I’ve hinted for a while that I would have news to report and well, here it is. 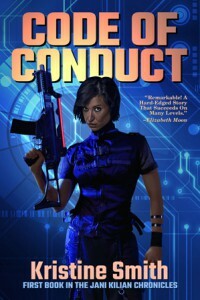 CODE OF CONDUCT will be reissued on December 1 through the good offices of Book View Cafe! It will be released in both ebook and POD formats, via the usual outlets. Further details as the day draws near–the production wheels are still turning. The cover was designed by Dave Smeds, and I am so, so happy with it. I’m also working on a new Jani novella, but that likely won’t be released until the first part of 2016. I can say that it takes place after the events in ENDGAME, and some of the usual suspects–Niall Pierce, Lucien Pascal, Hiroshi Mako–will make appearances. Check back for the occasional snippet.